It has been decided over the years by breeders and judges that the features mentioned below are unacceptable or undesirable in show cats. Please remember these are purely cosmetic faults and do not affect the health of the cat in any way, or make it any less suitable as a pet. An example of a LOCKET. Other common sites for white spots to occur are on the tummy, in the groin area or armpits. 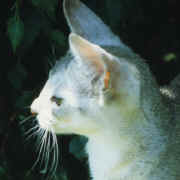 These kinds of white patches are genetic in origin so is important not to breed from affected cats. Their offspring may not show white spots but could carry the gene, and so pass the problem down to future generations. Up until the 1970's lockets were fairly common but because most breeders were very scrupulous about not breeding from cats with white spots the problem has now largely been eliminated. 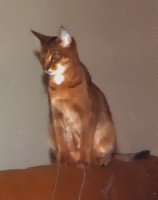 Tabby markings and barring on the tail, legs and chest is an integral part of any agouti pattern, but we are trying to eliminate it from our Abyssinians. Selective breeding over decades means we don't often see an unbroken necklet like this any more. Straight profiles often contribute towards an oriental look to the head, which we are trying to avoid. The correct profile is shown in the photo above.